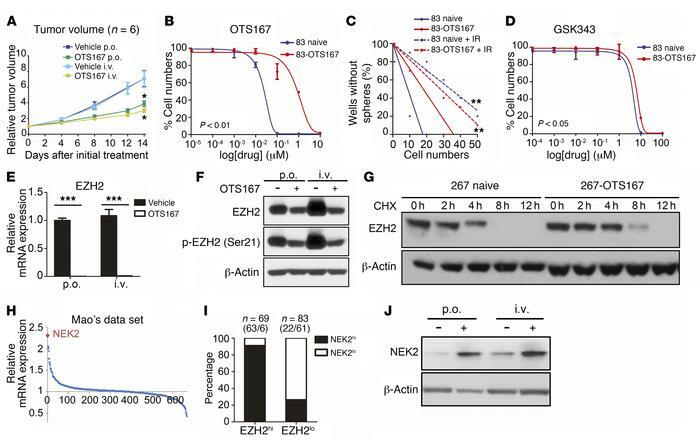 NEK2 plays an essential role in the posttranslational regulation of EZH2. (A) OTS167 treatment attenuated tumor growth in a U87 sub-Q xenograft mouse model (n = 6). *P < 0.05, by 1-way ANOVA. (B) Long-term OTS167 treatment induced a resistant population in 83 glioma spheres (n = 6). P < 0.01, by 1-way ANOVA. (C) An in vitro clonogenicity assay using limiting dilution neurosphere formation indicated that the OTS167-resistant population in 83 glioma spheres was more resistant to radiotherapy (IR) (n = 10). **P < 0.01, by ELDA. (D) An in vitro cell viability assay indicated that the OTS167-resistant population in 83 glioma spheres was still sensitive to the EZH2 inhibitor GSK343 (n = 6). P > 0.05, by 1-way ANOVA. (E) qRT-PCR showed that EZH2 expression was dramatically decreased by OTS167 treatment in a U87 tumor from a sub-Q xenograft mouse model (n = 3). ***P < 0.001, by 2-tailed t test. (F) Western blotting showed that EZH2 protein was only modestly affected by OTS167 treatment in a U87 tumor from a sub-Q xenograft mouse model. Replicate samples were run on parallel gels to obtain total EZH2 and phosphorylated EZH2 (p-EZH2) (Ser21) at the same time. (G) Western blotting for a CHX assay of 267 glioma spheres pretreated with OTS167 at the IC50 concentration (10 nM) for 4 weeks. (H) Genome-wide transcriptome microarray analysis (GSE67089) showed that NEK2 was the most upregulated kinase-encoding gene in glioma spheres. (I) NEK2 showed a strong association with EZH2 expression at the protein level in THPA database (EZH2hi samples, n = 69; EZH2lo samples, n = 83). (J) Western blotting indicated that NEK2 expression was increased in a U87 sub-Q xenograft mouse model after OTS167 treatment.